STATUS: Active, will be disocntinued. A balanced formulation containing a citrus solvent that cleans, emulsifies and dissolves stains as well as petroleum solvents but without toxic or harmful effects. 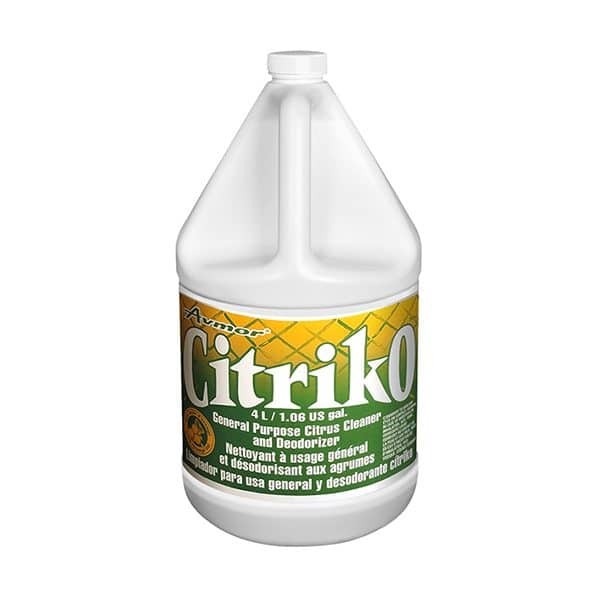 CITRIKO will clean and leave surfaces with a pleasant and fresh citrus scent. This product is not flammable. LIGHT DUTY: Combine product with water at 1 to 30 proportion (1 part CITRIKO with 30 parts water). HEAVY SOILS: Combine product with water at 1 to 5 proportion (1 part CITRIKO with 5 parts water). Apply solution using pressure spray. Allow 5-10 minutes of surface contact time. FOOD ESTABLISHMENTS: Equipment and surfaces subjected to direct food contact must be thoroughly rinsed with potable water after cleaning with this product. Avoid contamination of food during use. Do not store in food processing or food storage area.